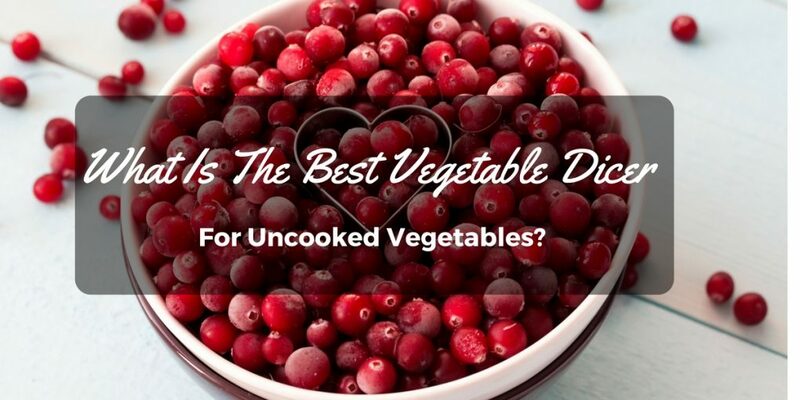 →What Is The Best Vegetable Dicer For Uncooked Vegetables? What Is The Best Vegetable Dicer For Uncooked Vegetables? Slicing and dicing vegetables is one cooking task that may require you a lot of time, especially when you’re no professional cook. Chefs on television make it look like an easy task. They cut through fruits and vegetables really quick. Some professional cooks can even dice a whole onion within one minute. If you’re like any average home cook, dicing a vegetable or fruit will definitely take you more than a minute if all you have is a knife. It’s a good thing vegetable dicers were invented. Because of those little contraptions, dicing all sorts of vegetables can be done in mere seconds, even when you don’t have enough culinary experience with a ﻿﻿knife. Want to start dicing your vegetables faster without using a knife? All you have to do is get a vegetable dicers and let it do all the work. Read on to find out all the things you need to know in order to get the best vegetable dicer for your home. If you ask me, there are two major benefits when it comes to using a vegetable dicer. The first benefit is speed. 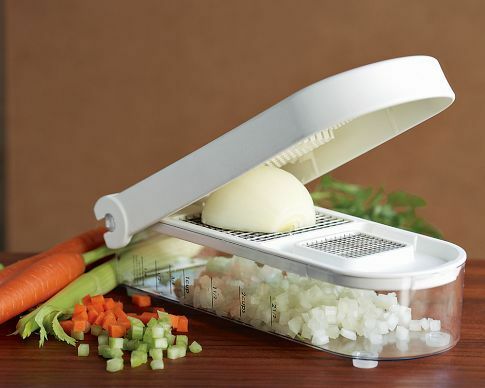 It is only with a vegetable dicer will you be able to cut a whole onion or large chunks of raw and cooked vegetables in well under a minute. Since vegetable dicers pretty much do half of the work for you, you will no longer need to focus and exert much effort into carefully dicing the vegetables. The second benefit is accuracy. Vegetable dicers come with metal cutters that come with precise measurements for dicing. This means you won’t have to carefully align the vegetables anymore. All you have to do is stick the vegetable inside the dicer and let it go through the metal cutters. In conclusion, a nice vegetable dicer will allow you to get perfectly diced cuts of fruits and vegetables every time within mere seconds. Vegetable dicers are simple contraptions that usually come with few parts. They are very simple to use and they don’t really possess a large number of factors that you should be mindful of. Vegetable dicers come in different shapes and sizes. 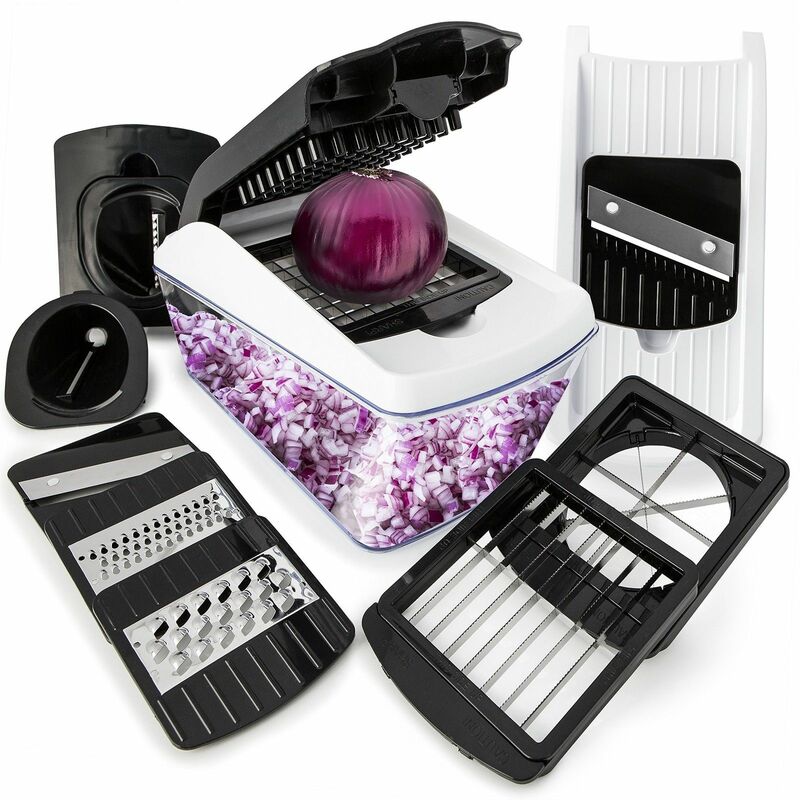 Try to go with a vegetable dicer that comes in a compact design so that you won’t need much counter space during use. A compact design also helps with easy storage. Since vegetable dicers come in different shapes and sizes, it is safe to assume that they all differ in capacity. 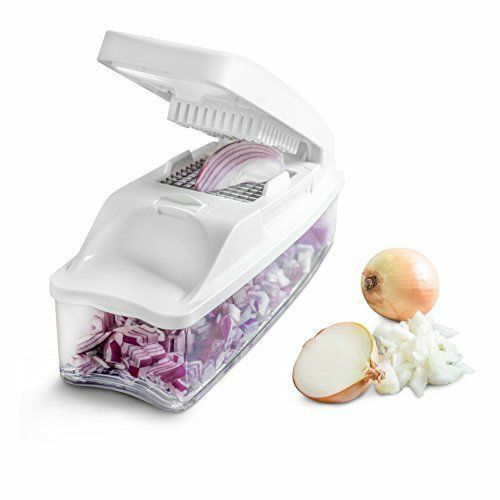 Try to go with a vegetable dicer that will allow you to cut at least half of a whole onion in just one go. Even though vegetable cutters are quite simple to use, plenty of people still commits certain mistakes that make their vegetable cutters totally ineffective. To effectively use your vegetable cutter, the first thing you have to do is wash and peel your fruits and vegetables, especially if the food you’re working with has tough skin. If you don’t peel or clean your vegetables, it's skin may get in the way of the cutter itself, making it less likely to cut through the whole vegetable. Another thing you must always perform is cutting your vegetables in appropriate chunks. Doing so will allow you to seamlessly push the metal cutter into the vegetable, therefore slicing it completely in one go. 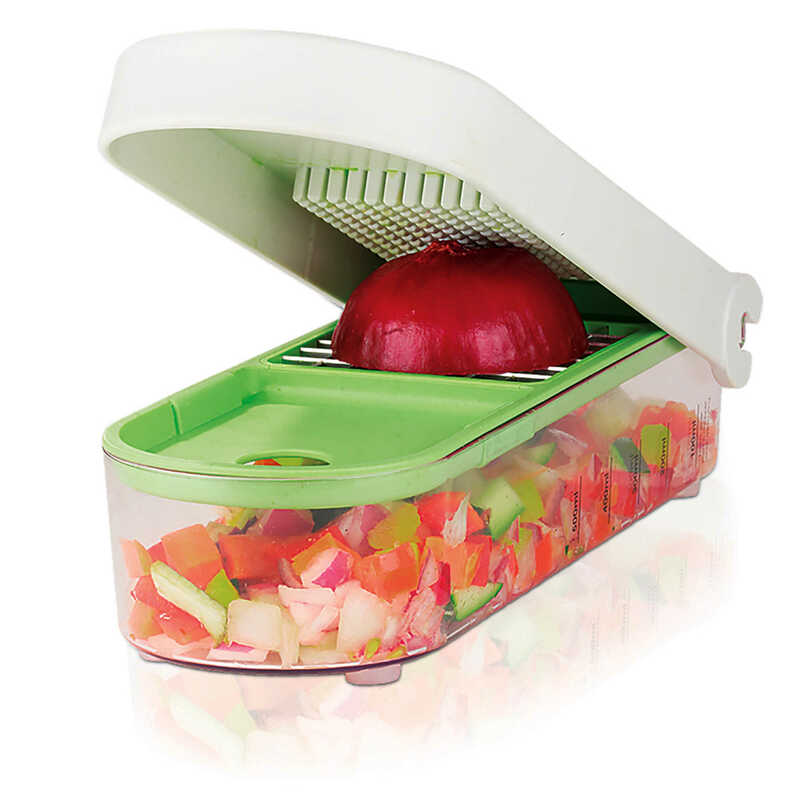 The Vidalia chop wizard is a simple vegetable dicer that you can use right out of the box. 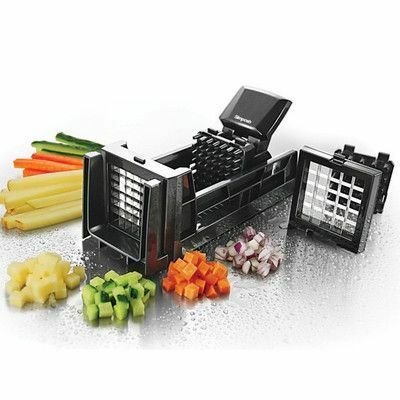 With this vegetable dicer in your kitchen, you will be able to seamlessly cut all sorts of ingredients including raw vegetables, fruits, cheese, boiled eggs, and more into small cubes. What I like about this product is that it comes with a handy catch container that allows for less messier clean ups. It also comes with 2 sharp cutters that will let you create perfectly cut cubes every single time. 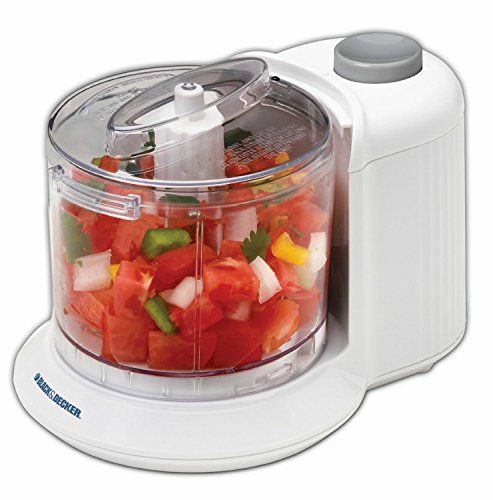 This Tiabo vegetable and fruit chopper is probably one of the most durable products in this list. It is made with high quality and reinforced food grade material that doesn’t react to acidic ingredients. What I like about this vegetable dicer is that it comes with three different blades for added versatility and use. Each blade comes with a different cut that will allow you to create diced vegetables and fruits with varying sizes. ​This vegetable chopper probably has the largest capacity in this list. 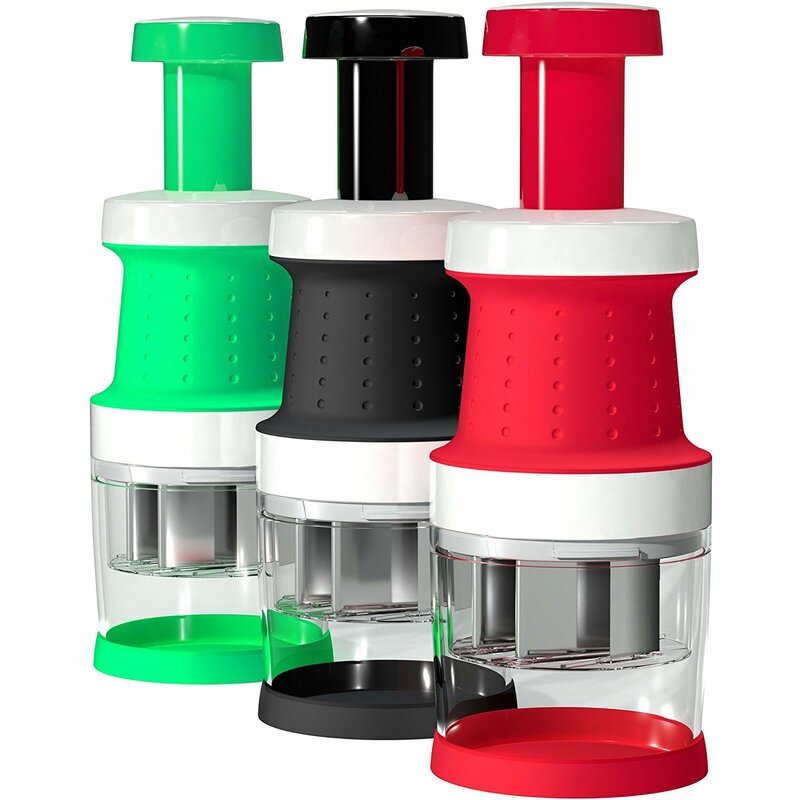 This vegetable dicer can easily hold up to 4 cups of diced vegetables, which is a plus if you are to use this for multiple vegetables. 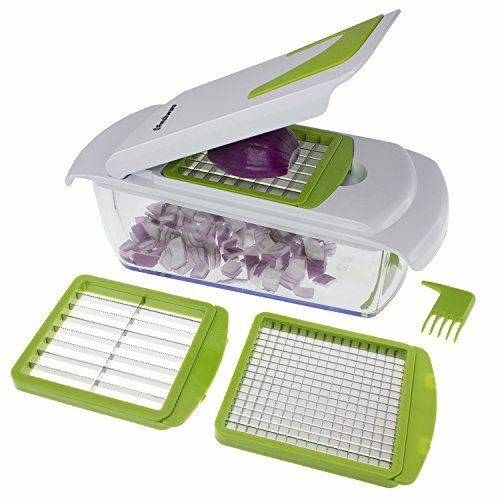 Aside from having a large capacity container, another great thing about this vegetable dicer is that it is made with BPA-free and professional grade materials. This means that it is completely safe to use on all sorts of foods. This vegetable chopper is the most versatile one in this list if you ask me. It can offer you multiple uses because it is basically an 8-in-1 kitchen tool. With this product at your disposal, you will be able to dice, chop, julienne, ribbon, and grate all sorts of ingredients. It comes with a 1-quart container tray, several slicers including a dicer, straight ribbon blade, julienne blade, long cutter, mandoline slicer, julienne slicer, fine grader, and coarse grater. 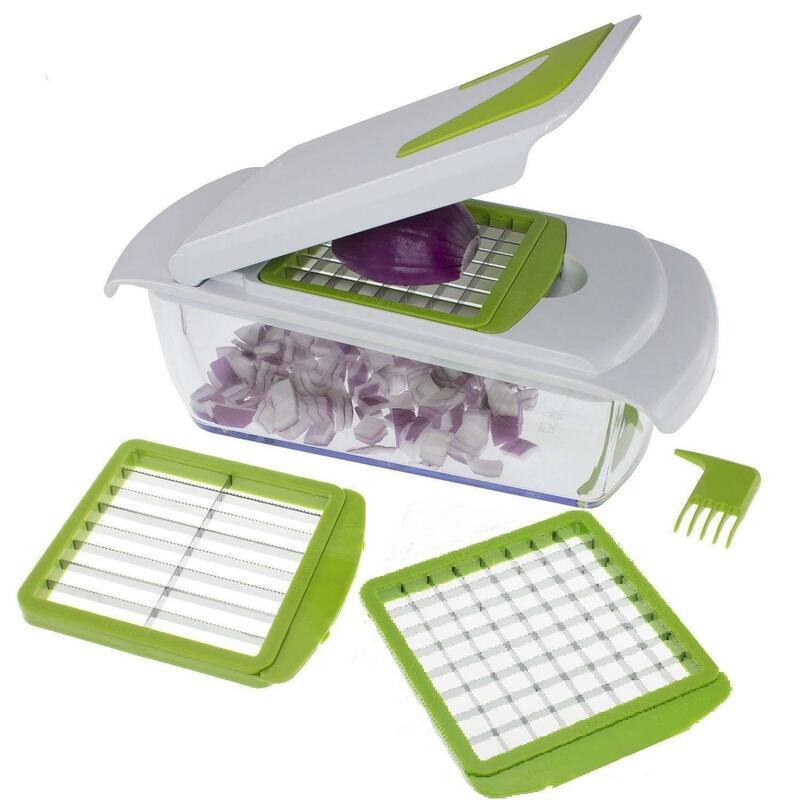 This dicer is also made with BPA-free materials that ensures your overall safety and healthy. It also comes with a 100% money back guarantee. 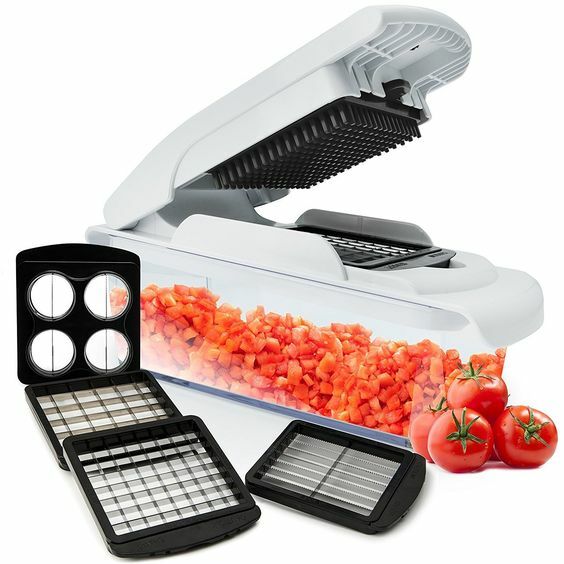 ​This vegetable dicer is the most compact one in this list. If you don’t really have much counter space or storage space, this vegetable chopper will allow you to create perfectly diced foods without giving you the trouble of storing it away. The Tiabo Vegetable and Fruit Chopper could probably be the best vegetable dicer that you can add to your home. 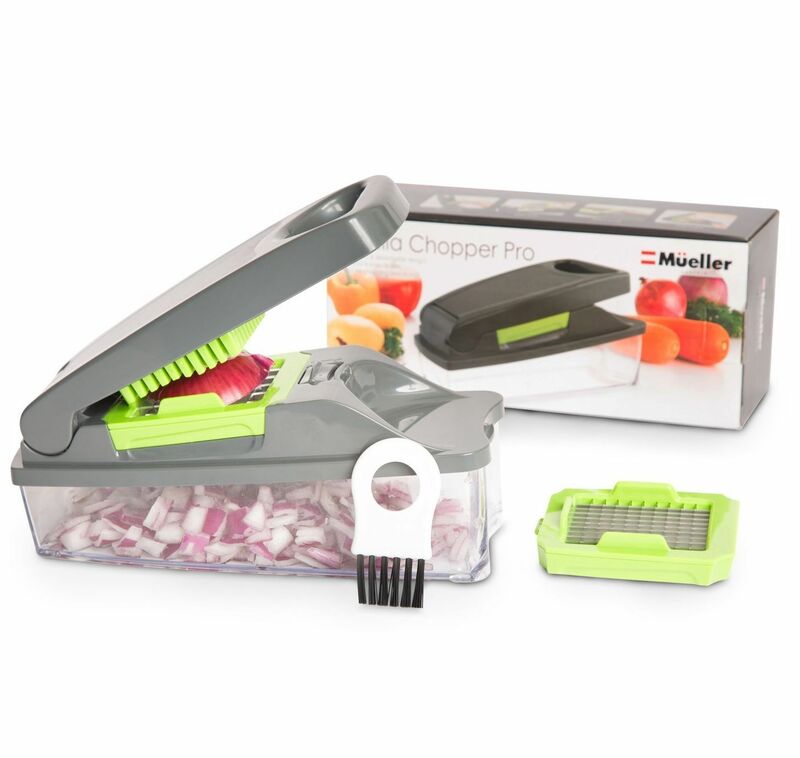 It comes with three different cutters that will allow you to create different sizes of diced vegetables, it’s easy to clean, easy to use, it comes with a container for less messy usage, and it is completely dishwasher safe.